By Dr. Xiaomei Tan, Washington, D.C.
Mapping affected populations fills information gap. Editor's note: While billions of dollars are being spent by international organizations and governments to combat the HIV/AIDS pandemic, little has been done to determine the effectiveness of these programs. 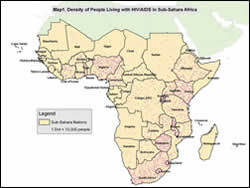 The author demonstrates how GIS can help monitor and evaluate HIV/AIDS programs targeted at sub-Saharan Africa. All figures are given in U.S. dollars. Monitoring and evaluating are key components of social development programs. Each year more than $300 billion is spent by developing countries, international agencies, and developed nations on these programs. While social development programs have clear goals, evidence documenting their progress, impact, and outcomes is lacking. Some researchers have stated that "we are facing an evaluation gap" (Savedoff, Levine, and Birdsall 2006). This gap seems wider in global HIV/AIDS programs. HIV/AIDS is the largest health crisis facing the world today. In 2003, the World Health Organization reported that 40 million people worldwide were living with HIV/AIDS, and the pandemic has already killed nearly 30 million people. New infections occur at a rate of 14,000 per day. 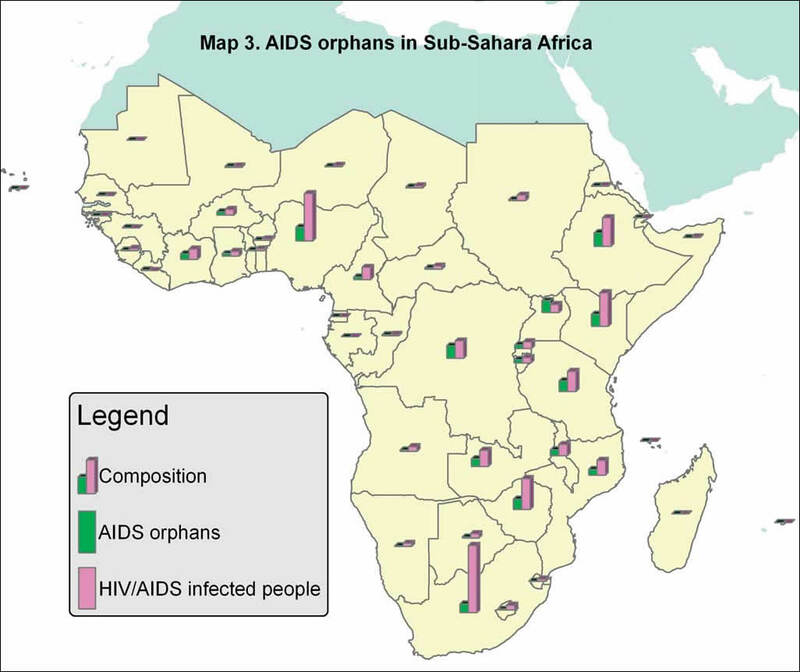 This article illustrates how GIS can be used to evaluate global HIV/AIDS programs by comparing affected populations and fund distributions and highlights funding shortfalls. GIS analysis was also used to reveal the changes caused by interventions. Overall, the analysis provides insight into the effectiveness of current global HIV/AIDS programs, identifies the focus of program actions, and improves decision making. With such huge investments, monitoring and evaluating seem especially important to understand if money is being well spent. The first step in evaluating these programs is to understand the distribution of infected persons in the area of interest. 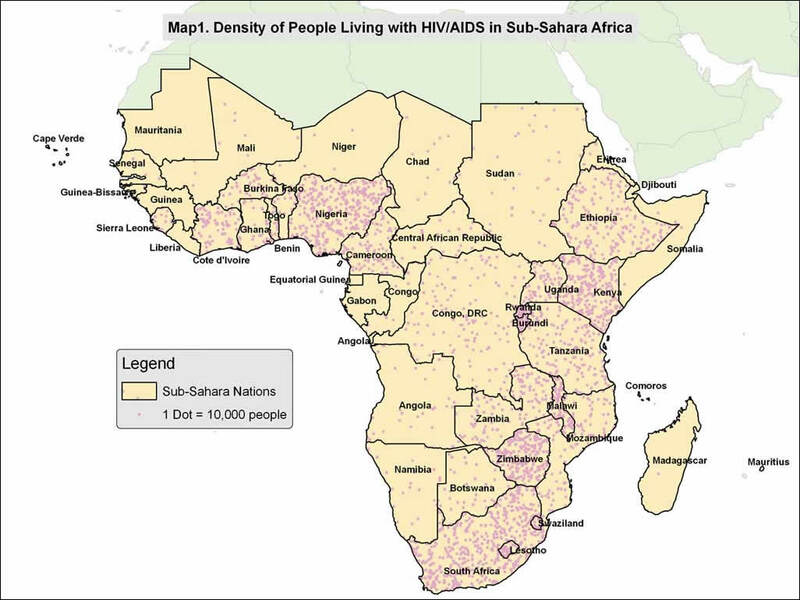 GIS enables analysts to create maps that demonstrate where high concentrations of people with HIV/AIDS are living in Africa. Using data provided by the World Bank, Map 1 reveals the density of population living with HIV/AIDS. Each dot represents 10,000 infected persons. The dots are assigned based on the density of the general population in each country. Southeastern Africa and part of the Ivory Coast have much higher densities. Rwanda, Burundi, and Lesotho have the greatest density of HIV/AIDS-infected people52, 37, and 30 HIV/AIDS-infected persons per square mile, respectively. Consistent with the density distribution, countries in southern Africa also have the highest infection rate. 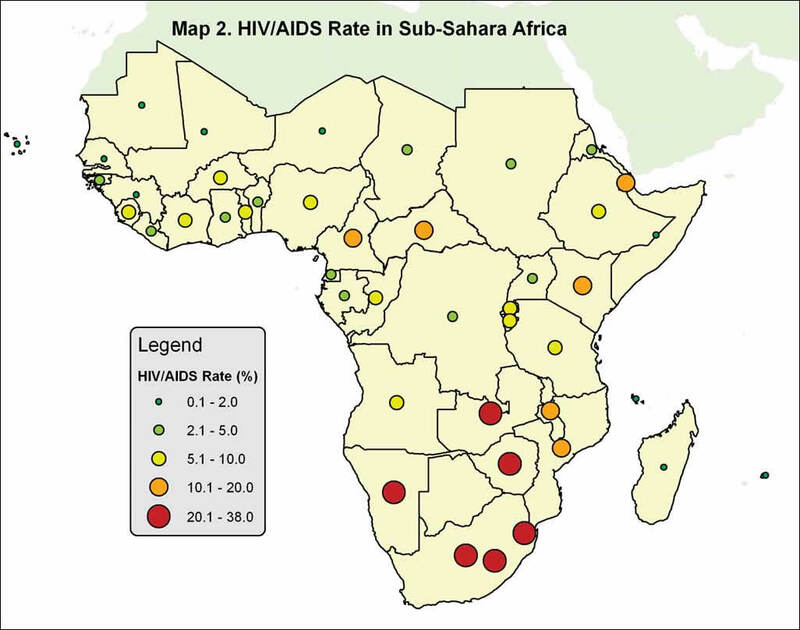 On Map 2, the smallest circles represent an HIV infection rate of 0.1 percent to 2 percent and the largest circles represent an HIV infection rate of more than 20 percent. 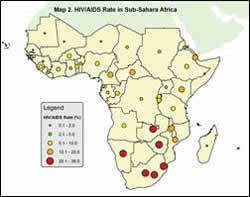 Botswana, Zimbabwe, and Lesotho have HIV infection rates of 38.8, 33.7, and 31 percent, respectively. sub-Saharan countries. 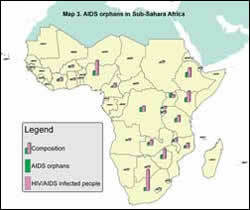 Nigeria had the largest number of AIDS orphans (approximately 1 million) followed by Ethiopia with 990,000 orphans. In Uganda, the number of AIDS orphans was greater than the total number of HIV/AIDS-infected people. As the information presented HIV/AIDS in Map 3 shows, while countries in sub-Saharan Africa face the same threat from the AIDS pandemic, each country may have different priorities in mitigating the crisis. For Uganda and central Africa, countries where the number of AIDS orphans outpaces or matches the total number of infected people, providing livelihood, education, and health care opportunities for the orphans should be considered the priority. In countries like South Africa, prevention and treatment are the highest priorities.